Discovered over 2000 years ago, tofu is a highly nutritious, protein-rich food that is made from the curds of soybean milk. 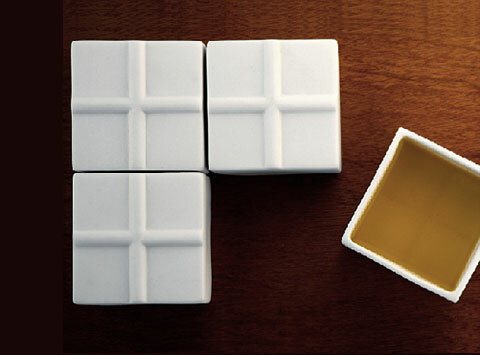 Inspired by this healthy food ingredient, this stylish tea set features unique porcelain tea cups, resembling the tofu’s rectangular blocks. Simply by displaying this charming set on your table, you can enjoy the visual impact of Asian authentic feel. Serve your guests your favorite Oolong or black tea and treat yourself to a peaceful moment of bliss. 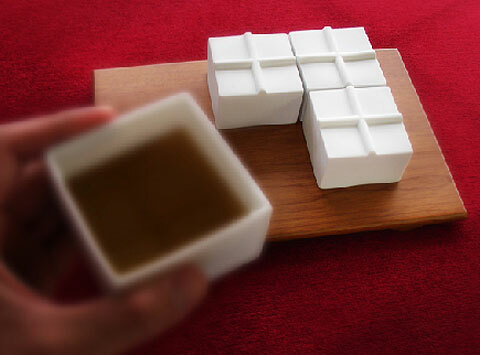 The small, rectangular cups are displayed upside down, presenting a simple decorative pattern; turn them over and the pattern becomes a tiny base for each cup. Simple yet elegant. 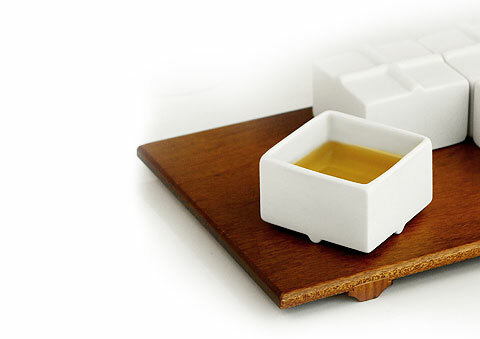 Available in two sets: large and small; the large set includes a brown wooden tray with 4 white porcelain cups. The smaller set includes 2 cups and 2 black porcelain coasters.